Seek stellar performers? -go see Pierson Ford of Aberdeen, SD. I went to this dealer seeking another opinion for an ongoing issue on my 13 Focus since it was new, AND after MANY attempts (communications with Ford) + visits back where I purchased the car NEW. I must add prior to visiting Pierson's, I NEVER thought this fine little car would EVER be made right. I knew it had an issue. I found a group who CARES and can diagnose @ Pierson Ford. I was met by a curious & courteous advisor and In a matter of a mins, had a confident, expert diagnosis. Parts placed on order; car worked on and I must add, to PERFECTION. This particular case may sound routine, but it was Pierson's can-do, desire and clear ability to correct an issue thats worthy of mention; as this problem has been ONGOING since the cars' 'birth. It was so incredibly refreshing to work with such a fine group who knew how to make things RIGHT. Finally! Woo-Hoo! I honestly thought this car would never work right! Thank you, Pierson Ford! If you're seeking no-nonsense professional staff, I definitely recommend Pierson's Ford of 'Abby' for your next service. Hi Ford Dealership Management, I want to personally thank you and let you all know how appreciative I am for you excellent customer service. My wife and children experienced car trouble while in Aberdeen, SD. They pulled into your dealership and the experience was first class from their experience with customer service to the way their every need was met by your team. Starting from the service department assistance diagnosing the problem before closing time to assisting with financing options. Moving on the the individual assistance the staff showed towards checking in with them as they waited for the diagnosis to be complete. Moving on to the shuttle service was outstanding. You turned a relatively stressful situation into a pleasant one for my family. I happened to be across the country on business so the call from my wife was very stress producing for me to know that there was nothing I could do to help from Washington D.C. The service was so outstanding that you have just converted me to do future business with you. We live in Seattle so that is a long trek for service but because of your quality customer service and commitment to excellence. I am forever grateful and sharing this experience with all our friends and family. Again Thank you. I love my new Ford Fusion! I actually gave up my Honda in the Ford Fusion Challenge, which I thought I never would. The same day I test drove the Fusion I was actually working with another dealership in town on a new Honda Accord. I must say my buying experience at Pierson Ford (Aberdeen, SD) was the BEST EVER vehicle shopping! I was being pushed so heavily at the Honda dealership that I turned off. From there I went over and test drove the Fusion and I was sold! The Fusion is a much quieter and smoother riding car than the Accord. The Fusion sold itself!! I must also say my salesperson (Kyle Zimmer) was wonderful! The car I wanted was not the lot but he said he could find exactly what I wanted. Within an hour my car was located :) I was very impressed on how both Kyle and Lee Keller (finance manager) worked with me on the lease program. The signing of all the paperwork was a breeze!! I have definitely changed over to the Ford line of vehicles!! Thanks for challenging me to take the "Ford Fusion Challenge!" 1. A great group of people 2. Very professional 3. Have a sense of humor 4. When you walk out the door, they make you feel that "you matter to them"
Sales The Salesperson that worked with me was excellent. The reason that I came to Ford was because of a bad experience with the Chrysler dealership. I have done business with them for years as well as my parents. I have purchased many new and used vehicles with the Chrysler Center. When I went in this year to lease a new vehicle, they treated me like crap and wouldn't even help me. So I told them that I would take my business somewhere else and so I did. 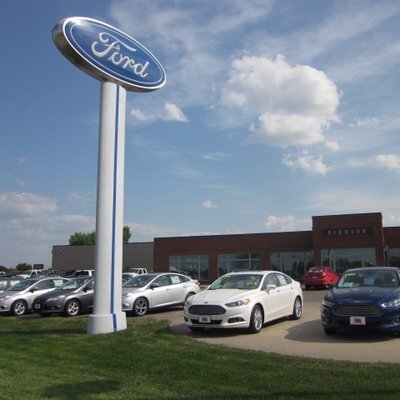 When I walked into Pierson Ford, I was greeted and they fought like hell to get me what I wanted, and they succeeded! The technician that worked on my vehicle was a genius!